American historian and analyst Daniel Pipes said he expects that the bill put forward by U.S. Senator Ted Cruz to classify the Muslim Brotherhood as a terrorist organization will pass following discussions taking place in the White House and Congress. 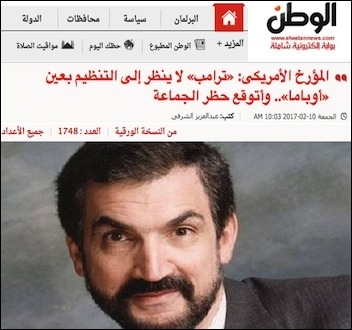 Pipes confirmed in an interview with Al-Watan that there is no need for the criticism directed by some at President Trump because of his attempts to deem the Brotherhood a terrorist organization, pointing out that this is not a radical step at all, especially since other countries in the Middle East, such as the UAE and Saudi Arabia, have already banned it. How do you see the crisis in Syria? I see four factions (regime, ISIS, other Sunnis, Kurds) with everyone fighting everyone with one exception (regime and ISIS). Many powers are also involved there. What are your expectations for it? Do you think that Donald Trump being president of the United States will make a difference in the Syrian war? Probably it will, because Trump focuses more on defeating ISIS. No, it's a mistake. The regime is responsible for over 90 percent of the deaths in the country and it is allied with Tehran and the most dangerous regime in the Middle East. Some analysts accuse former President Obama of worsening the situation in Syria by the limited support for the Syrian rebels, do you agree? Obama did a poor job in Syria but it could have been worse. I wish he had given more support to the Kurds and some of the Arab Sunnis. 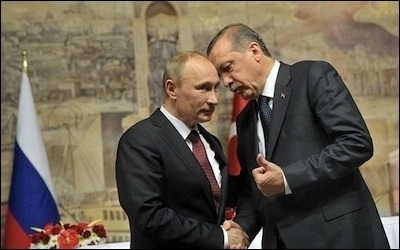 Turkish President Recep Tayyip Erdoğan (right, with Russian President Vladimir Putin) is "brilliant at domestic politics but inept at foreign affairs," according to Pipes. How do you see the Turkish position in that crisis, especially after the Turkish government retreated from its harsh criticism of the Syrian President? Turkish president Erdoğan is brilliant at domestic politics but inept at foreign affairs (he resembles Saddam Hussein that way). Ankara's position in Syria has weakened as it tries to have good relations with Moscow. Do you think that Israel is winning from the situation in Syria? So far, Israel has neither gained nor lost much from the crisis in Syria. Looking ahead, that could change if the Iranian-backed regime controls more of the country, in which case Israel would lose. As for Mr. Trump's executive order, do you think it will really protect the United States? The basic idea of protecting Americans from jihadis is an excellent one. But the execution was inept. Of many mistakes, the most important was judging immigrants by nationality instead of by individual. Will it fuel hatred toward Americans in those 7 countries? I can't imagine that the nationals of Iraq, Iran, Libya, Somalia, Sudan, Syria and Yemen will hate the United States because they can't enter it. Plus, this is a temporary order. Do you think that Mr. Trump will put the Muslim Brotherhood on the terrorism list? Yes, I think the chances are good that this will happen and I am part of that effort. It will hardly be a radical move; it's been done elsewhere, notably the United Arab Emirates. What are the possible implications of such ban? To recognize that the single most important Islamist organization has jihadi violence at its core. The White House called on Israel to stop announcing "unilateral" West Bank building that "undermines" Trump's efforts; do you believe that the US president will go back on his promises toward Israel? The statement you quote was later in the day modified and made more mild. Trump is very unpredictable. I have no idea what his policy toward Israel will be. What about his promise to move the US embassy to Jerusalem, was it just publicity during the campaign? I think it was serious. But that does not mean the move will happen. Can you draw us the best and worst case scenarios for the Middle East? Best: The Iranian people overthrows the mullahs. Worst: The Iranian regime gets nuclear weapons. The Louvre terror attack prompts to ask why France is once again the target? The size of the France's Muslim population and the belief among some of it that intimidation will turn France into an Islamic state explains the repeated acts of jihadi violence. Do you think ISIS will collapse soon? Yes, and I am surprised it still exists. Would it be the end of the terror wave if it collapses or there would be just another terror group? Jihadi violence comes from many sources. Were ISIS defeated, that would eliminate one important source. Many others would still remain. 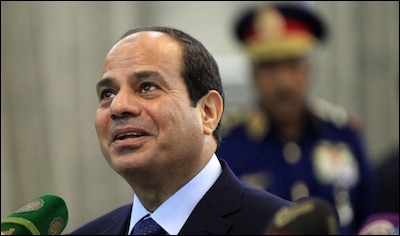 Egypt's President Abdel Fattah al-Sisi, "making too many mistakes." How do you see things in Egypt? I worry that President Sisi is making too many mistakes. I worry about the water supplies; about hunger and even starvation. I also worry about the Islamists coming back to power and this time staying. Do you think the country will recover soon? That would happily surprise me. Do you think Mr. Trump would really withdraw the US from the Middle East? As I said earlier, I find him too unpredictable to guess what he will do. And if that is the case, what would be the implications for the ongoing wars in the region? A weak American presence is a recipe for aggression and warfare. Steve Bannon, the chief strategist at the White House, said that he has no doubt that the US will be in another "major" war in the Middle East. Do you agree with that? No, after intense involvement in Afghanistan and Iraq, Americans are not ready for another ground war in the Middle East. What is the best way to deal with the situation in Iraq, especially after 14 years since the American invasion? The American failure in Iraq is nearly complete: ISIS controls Mosul, the Iranian regime nearly controls the government in Baghdad, communal and tribal tensions increase, and the Mosul Dam becomes ever-more dangerous. I don't see what the new administration in Washington can do about all this. Do you agree with those who accuse the US of being responsible for what is going on in the Middle East? I do not agree. Yes, the Obama administration made many mistakes but I reject the notion that Americans make the key decisions in the Middle East or that the U.S. government has an obligation to save Middle Easterners from themselves. Middle Easterners are responsible for the Middle East. What is the best way to discern moderate Muslims from extremists? Through detailed, extensive, and repeated questioning by skilled interviewers. I provide details on how to do this in "Smoking Out Islamists via Extreme Vetting." Middle East Quarterly, March 2017. Every time an attack happens, the guilt falls first on the Muslims and they are called "terrorists", but when the attacker is non-Muslim, the media uses another words like "psycho", "mentally ill" or anything but "terrorist." Why is that and why does the blame always fall on Muslims despite the fact that there are millions of Muslims living in the US and Europe and they are not committing any terror or criminal attacks? I disagree with your observation. The politicians, press, police, prosecutors, professors and priests are extremely reluctant to refer to "terrorism" by Muslims and even avoid mention of Muslim attackers. For example, when an Egyptian jihadi attacked soldiers at the Louvre Museum in Paris and was shot by them in early February, the New York Times titled its story "Louvre Museum Evacuated After French Soldier Opens Fire."